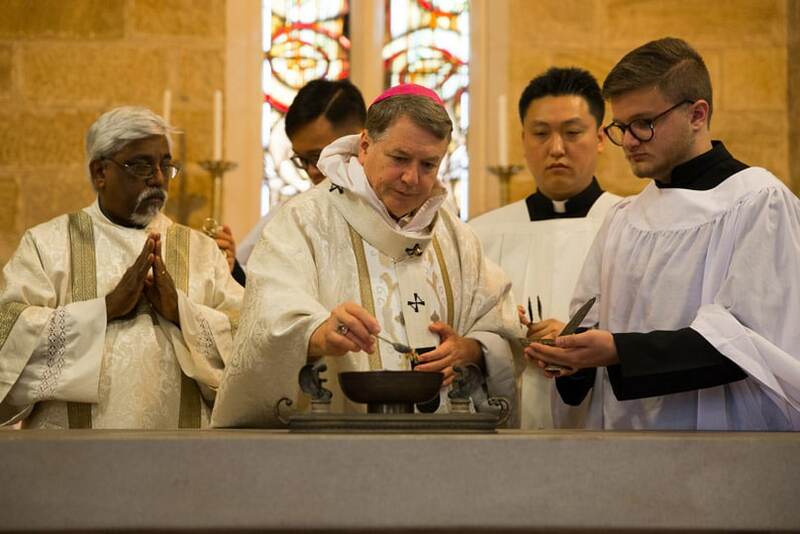 Archbishop Fisher's homily: What makes a church a church? 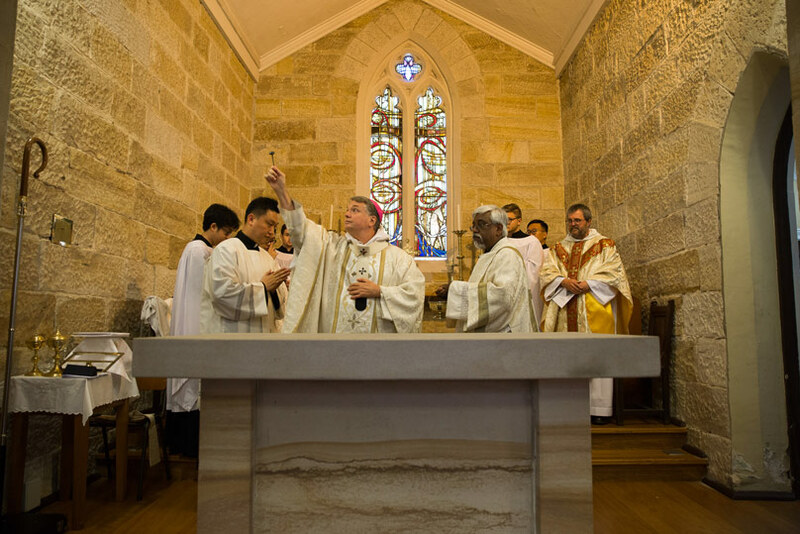 Home Opinion Archbishop Archbishop Fisher’s homily: What makes a church a church? 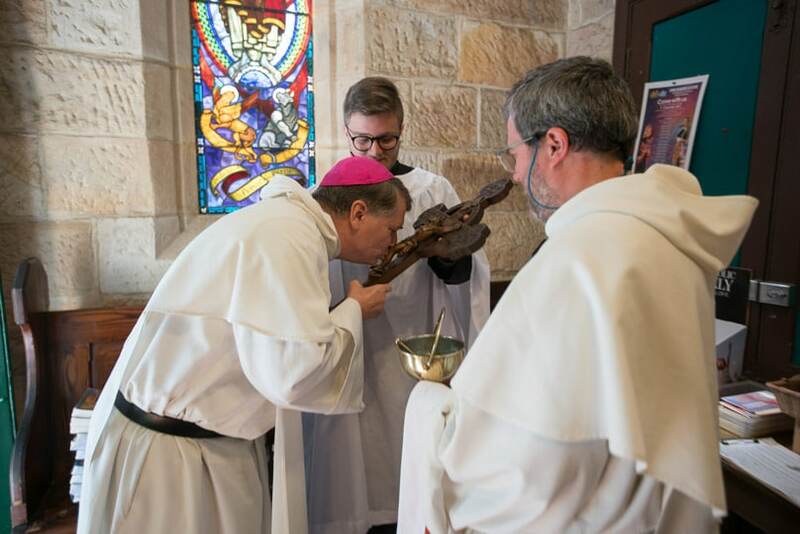 Archbishop Fisher’s homily: What makes a church a church? Every great religion has had its sacred sites where people felt closest to God. Our Jewish ancestors counted the Jerusalem Temple their holiest place, where God’s shalom dwelt, and the prayers and sacrifices of the cult were offered. Today we heard the Prophet Nehemiah’s account of the dedication of that temple and altar (Neh 8:2-10). Fr Ezra read and preached from early in the morning well into the afternoon, till all were in tears, whether because they were deeply moved or plain exhausted. God was certainly pleased. He had already provided clear prescriptions for the dimensions, materials and rites of consecration of temple, ark and altar, the offerings to be made and incense used to carry the prayers up to Him – and cover up the smell of animal sacrifice. True worship, however, required more than prescribed sacrifices: the heart of the worshipper had also to be offered to God. So much for the ancients: but aren’t modern Christians different? After all, in our Gospel this morning Jesus teaches the woman that it is not where you worship that matters so much as how: it must be “in spirit and in truth” (Jn 4:19-24; cf. 2:19-21). St Peter in our epistle today says that we are living stones of a spiritual house; St Paul writes that each of us is an individual chapel for the Holy Spirit (1Pet 2:4-9; 1Cor 3:9-17; 6:19-20). So haven’t we outgrown the physical sites, sacrificial rocks and ritual offerings? Why do we still consecrate our churches and celebrate their jubilees? Well, one reason might be because Jesus took churches so seriously Himself. He began His public ministry by preaching in a synagogue in Capernaum. And crucial moments in His life took place against the backdrop of the Temple: His presentation as a baby, His finding as an adolescent, His praying, teaching, debating and healing as an adult; His confrontation with the authorities as He cleansed the Temple of the money-changers and His trial by the Sanhedrin in the Temple precinct. Jesus, as His apostles observed, was on fire for this place, like incense on a brazier (Jn 2:17), determined it should be a holy place. What is it makes a church a holy place, the Father’s house? The liturgical act of dedication and what happens thereafter or, in this rather unusual case, for 150 years already before, as well as in the years after. A church, then, is not a building so much as space, withdrawn from the sphere of the ordinary – of work and play – and dedicated to God. When Jesus drove the money-changers out of the Temple, He was not making a statement against capitalism, banking or making a living. Rather, He was saying this place is not for that use: it has been dedicated to something else. So today, at long last, we will complete the Christian initiation of the Church of St Bede and its altar. You will notice the parallels with a live person’s initiation. 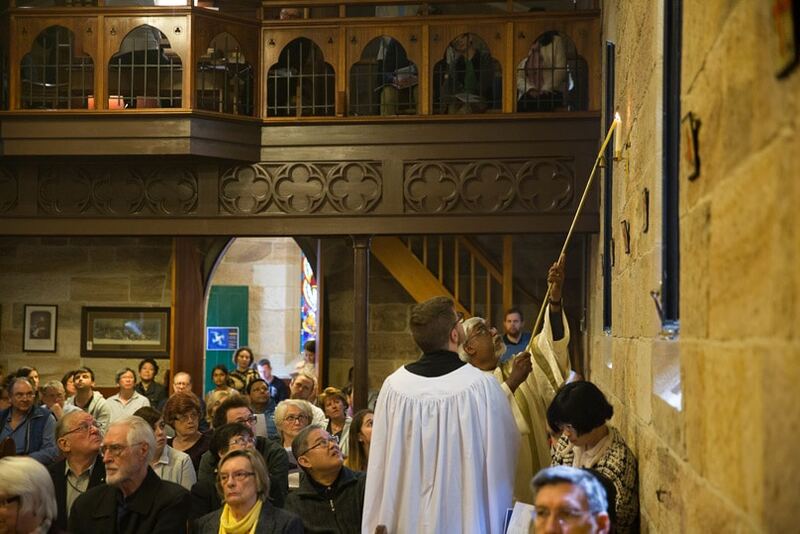 We began our Mass by sprinkling the church in recollection of when Archbishop Bede Polding baptised it 150 years ago. After a post-baptismal “mystagogia” of readings and preaching, we will join our stony catechumen in professing the faith, and then pray for him, invoking the saints as we do for the catechumens on Easter night. 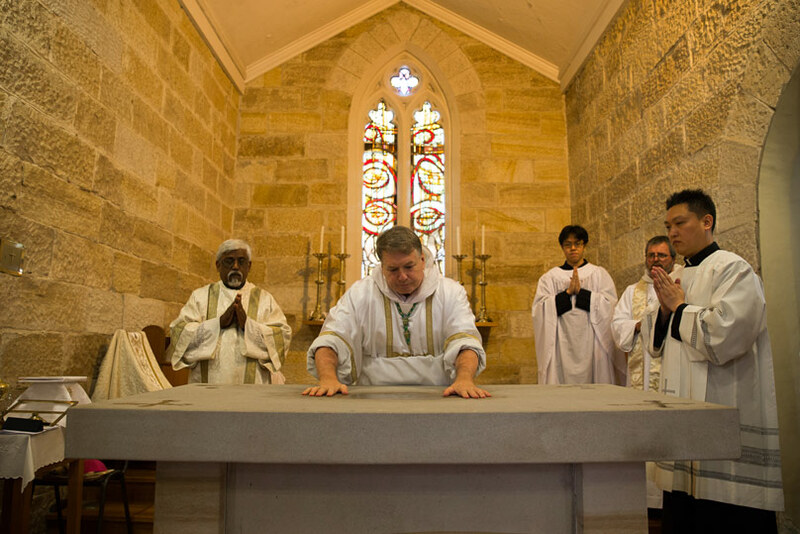 Not just for its own sake is a church building dedicated, an altar consecrated, a person baptised: no, it is for a sacred purpose. Church-altar-Christian, all are remade in Christ and for Christ. He is our true church and altar, and so this place speaks to us of Him. 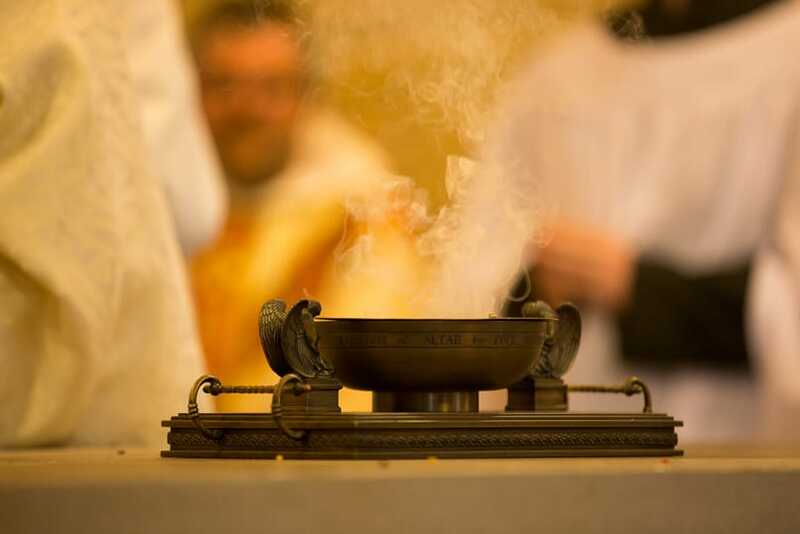 When I splashed holy water about, church and altar were being Christ-ened; when I anoint them with Chris-m, it will be as a sign of the Anointed One. Stone, fire and incense: all recall the ancient sacrifices that foreshadowed Christ’s all-sufficing sacrifice. Church, altar and Cross: all point to fulfilment in His Paschal mystery. After all this is done, it will be obvious our church is no mere museum for sacred objects, our altar no mere table for a special meal. No: this is the place to praise, bless and preach; to sacrifice, intercede and thank; to hymn, bow and genuflect; to honour, consecrate and commune; to christen, absolve and commission. 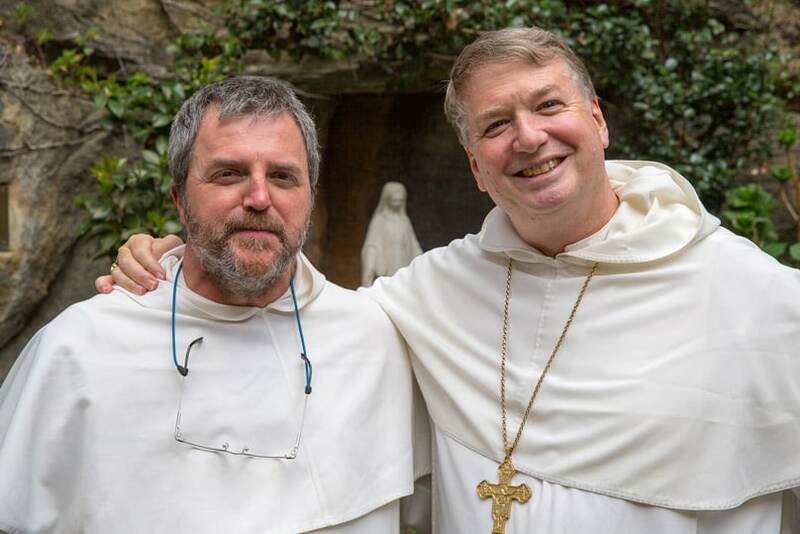 Here the most extraordinary things occur: babies are changed into children of God; bread and wine into Christ’s body and blood; couples into spouses; singles into priests and religious; sinners into saints. Such exceptional events deserve an exceptional place. Of course, the People of God are more truly the Church than any chapels they build. The 8th century monk Bede earned the title “Venerable” for his many books of science, theology and poetry, but above all for writing the ecclesiastical history not of the Anglo-Saxon church buildings but of the English people that made up the Anglo-Saxon Church. A thousand years later another Bede was born, who shared with his namesake a noble birth, broad education, wide travels and Benedictine monasticism. He became the first Archbishop of Sydney and Metropolitan of Australia. He was a born missioner who scorned every personal hardship to build up the Church in Australia, commanding the construction of churches such as this one, consecrating the Old St Mary’s and commissioning the new Cathedral after the first (and second) burnt down, directing the building of schools such as once shared this site, and establishing a hierarchy of bishops, clergy and religious. But all this was all for the sake of the Church built of living stones, his far-scattered and disadvantaged flock. He laboured incessantly to instruct them so they could receive the sacraments, established missions and parishes to care for them, presided over provincial synods to plan for their pastoral care… It was for this Bede, as much as for his venerable namesake, that this church and parish were named. and what judgement his soul will receive. 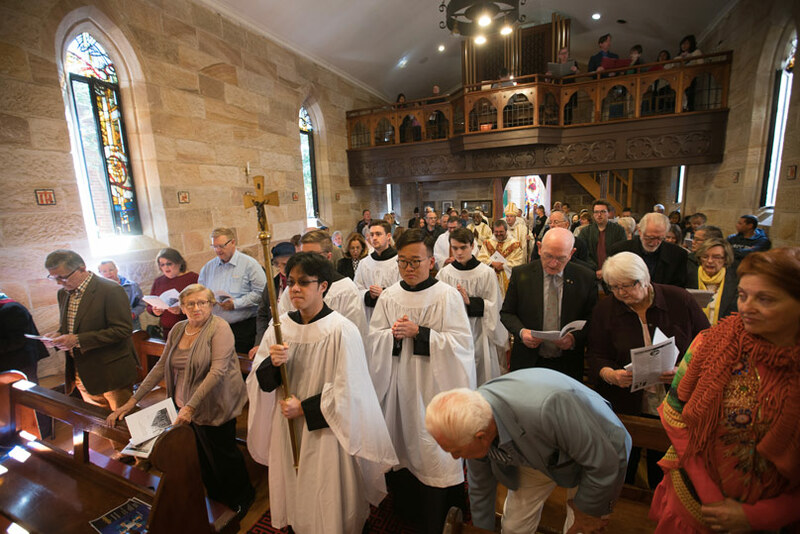 This is the edited text of the homily preached by Archbishop Anthony Fisher OP at the consecration of the church and 150th anniversary celebration of St Bede’s Church in Pyrmont on September 10, 2017.